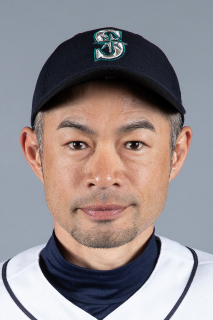 : Ichiro Suzuki…resides in Kobe, Japan with wife, Yumiko…graduated from Aikoudai Meiden High School in March 1992…was first Japanese position player to sign with a ML club…was third Japanese player to sign with Mariners: Kazuhiro Sasaki and Mac Suzuki…helped Japan to back-to-back World Baseball Classic titles (2006, 2009). Signed by Seattle as a free agent March 7…made his 12th career Opening Day start for the Mariners on March 29 vs. Cleveland…collected 2 hits March 31 vs. Cleveland, marking his 3,801st and 3,082nd career hits in the Majors, surpassing Hall of Famer Cap Anson (3,081) for 21st-most hits in Major League history (Elias)…had 3 multi-hit games to rank 11th all-time with 909 games with 2+ hits…was 9-for-44 (.205) with 5 runs and 3 walks in 15 games…named to the role of Special Assistant to the Chairman on May 3. Became 30th player to reach 3,000 hits on August 7 at Colorado...His 3,000th hit was 7th-inning triple; joined Paul Molitor as only players to hit triple for 3,000th career hit...Finished season with 3,030 career hits, 25th on all-time list, according to Elias...Began season tied with Barry Bonds for 35th place, at 2,935...In 2016 he passed Frank Robinson (2,943), Willie Keeler (2,955), Sam Crawford (2,964), Sam Rice (2,985), Roberto Clemente (3,000), Al Kaline (3,007), Wade Boggs (3,010), Rafael Palmeiro (3,020), and Lou Brock (3,223), and finished trailing Rod Carew (3,053) for 24th place...Recorded 4,257th combined career hit between MLB and Japan on June 15 at San Diego, unofficially surpassing Pete Rose's career hit total...Finished season with 4,307 combined career hits between MLB (3,030) and Japan (1,278)...Had 26 multi-hit games, tying Julio Franco (2004) for 11th- most in a season by a player 42-or-older...Became first National League player 42-or-older to record four-or-more triples in a season since Honus Wagner (9) in 1916, and just fifth overall (sixth time). The others were Joe Start (4) in 1885, Jim O'Rourke (5) in 1893 and Cap Anson (4 & 5) in 1894-95. The last Major League player 42-or-older with four-plus triples was Luke Appling (4) in 1950...Recorded 500th career stolen base on April 29 at Milwaukee...Just seventh player in MLB history with 3,000 hits and 500 steals, according to Elias. Joined Ty Cobb (4,191/901), Honus Wagner (3,430/724), Paul Molitor (3,319/504), Eddie Collins (3,313/743), Rickey Henderson (3,055/1,406), and Lou Brock (3,023/938)...On May 3 vs. Arizona, had first go-ahead pinch hit of career, driving in two runs with bases-loaded single...Had four hits in four at-bats on May 21 vs. Washington, a 3-2 win, becoming oldest player to go 4x4 or better in a game since 45-year-old Pete Rose went 5x5 as Reds' player/ manager against Giants on August 11, 1986...Recorded four, two, and four hits respectively in a three-game span from May 21-23, becoming first Major Leaguer age 42 or older to collect 10 hits over a three-game span since Hall of Famer Cap Anson did it, also at 42, in August of 1894. He also tied a Club record for most hits in a three-game span, joining Hanley Ramirez (2010), Luis Castillo (2003), and Preston Wilson (2001)...Also, became only player in Major Leagues since 1913 to have multiple four-hit games after age of 42 years, 113 days. Pete Rose was oldest to have one such game, when he had five at 45.119 on August 11, 1986 vs. San Francisco. The others older than Ichiro were Sam Rice (44.138 on July 8, 1934 vs. White Sox), Carlton Fisk (43.115 on May 10, 1991 at Toronto), Honus Wagner (43.109 on June 13, 1917 vs. New York Giants), Carl Yastrzemski (42.286 on June 4, 1982 at California) and Rickey Henderson (42.273 on September 24, 2001 at Colorado)...Came off bench June 3 vs. the Mets as a pinch hitter in the seventh inning and ended up with two stolen bases. He was oldest player since at least 1913 to steal two bases in a game after coming off bench, and fourth-oldest ever with two steals in a game. On June 16, 2005, Julio Franco stole two bases at 46 years, 297 days to become the oldest with two steals. Rickey Henderson had three such games, doing so on May 29, 2002 (43.155), September 7, 2001 (42.256) and Sept. 2, 2001 (42.251). Honus Wagner was the other, stealing two bases at age 43.109 on June 13, 1917...Triple on August 7 was 116th of career between MLB and Japan, breaking tie with Yutaka Fukumoto for career mark by a Japanese player...Stole 508th career base at Citi Field against the Mets on August 29, his final steal of 2016; finished season six behind Barry Bonds and Willie Keeler (514) for 34th on all-time stolen base list...In eighth inning on September 6 against Philadelphia, connected for first home run of the season, 114th of his career and the first as a pinch-hitter...Recorded 900th multi-hit game of career on Sept. 13 at Atlanta. Among players in the modern era (since 1900), his 900 multi-hit games rank 15th all-time. Among players who debuted in the last 40 years (since 1977), only Derek Jeter (1,014), Paul Molitor (967), Tony Gwynn (951), and Eddie Murray (934) recorded more multi-hit games. In 89 games started, hit .235 (78x332) with five doubles, five triples, a home run, 19 RBI, and nine steals...Was one of seven qualifying MLB outfielders to post perfect 1.000 fielding percentage; only other Marlins' OF to accomplish the feat was Juan Encarnacion in 2003...Has 498 career SB, most among active players...Enters 2016 one triple shy of tying Yutaka Fukumoto for career mark for Japanese player (115)... Made first career pitching appearance on October 4 at Philadelphia; only two other players have ever pitched in an MLB game after producing as many career MLB hits as Ichiro (2,935): Ty Cobb and Wade Boggs...Had 24 hits in August, most hits in a month in his career since July 2013 (29)...Recorded 10,000th PA on August 25, joining Alex Rodriguez, Adrian Beltre and Jimmy Rollins as only active players with 10,000+ PA...203...Became oldest player in Club history with four-plus hits, going 4x5 on Aug. 18 at Milwaukee at 41 years, 301 days (previously, Andre Dawson, 4 H, 41 years & 272 days old)...Became 38th player in MLB history to reach 2,900 hits on July 29 vs. Washington...Had 45 plate appearances as a pinch hitter (9x42, 3 bb), the most of his career, far surpassing previous high of 15 in 2014...His nine pinch hits were tied for 16th in MLB...Recorded season-high four hits on August. 18 at Milwaukee; first four-hit game since July 28, 2013 vs. Tampa Bay...On April 29 vs. the Mets, hit first home run with Miami, and just third of career in an NL park (July 6, 2001 at the Dodgers, June 14, 2010 at St. Louis)...Became first Japanese player in Club history with a PH appearance on Opening Day vs. Atlanta (April 6); it was also his first career appearance at Marlins Park. Owns 4,122 hits between career in Japan and Major League Baseball (1,278 in Japan, 2,844 with Mariners and Yankees)...Recorded 4,000th career hit on August 21, 2013 vs. Toronto, becoming third player to reach 4,000-hit plateau when considering hits from the highest levels in U.S. and Japan, joining Pete Rose (4,256) and Ty Cobb (4,191)...Has 50 career games with four-or-more hits, the most of any active player, ahead of Alex Rodriguez and Albert Pujols (41 each)...Since 2001, has most hits (2,844) and multi-hit games (855) in ML...Owns three of top 17 single-season hit totals in the Modern Era (since 1900): 262 in 2004, 242 in 2001 and 238 in 2007. Joins Fred Lindstrom (1928 and '30) and Rogers Hornsby (1921-22) as only players with multiple seasons of 230-or-more hits...Had 2,696 career Major League hits through his 2,000th career game on July 14, 2013. According to Elias, only ?ve players who debuted since 1900 collected more hits through their ?rst 2,000 career games: Ty Cobb (2,796), George Sisler (2,753), Al Simmons (2,743), Rogers Hornsby (2,715) and Paul Waner (2,707)...Owns eight seasons with at least 200 hits and 100 runs (2001-08), joining Lou Gehrig as only players in Modern Era to reach plateaus eight times in their careers. Willie Keeler (1894-1901) is only other player to do so in eight consecutive seasons...His 37 career leadoff home runs rank sixth all-time...Recorded at least 150 hits in each of ?rst 12 ML seasons (2001-12), joining Paul Waner (?rst 14 from 1926-39), Richie Ashburn (?rst 13 from 1948-60) and Albert Pujols (first 12 from 2001-12) as only players to accomplish feat in Live Ball Era. Had streak snapped in 2013 (136 hits)...Owns 43 hitting streaks of at least 10 games in career, marking sixth most double-digit hitting streaks in ML since 1903 (Ty Cobb-66, Hank Aaron-48, Tris Speaker-47, Derek Jeter-46 and Al Simmons-44)...Owns 11 seasons (2001-11) withat least 50 multi-hit games, ?fth-most over the last 70 years behind Pete Rose (15), Stan Musial (14), Derek Jeter (14) and Tony Gwynn (13)...With 20 steals in 2013, became just third player who debuted in Majors since 1900 to record at least 20 steals in each of ?rst 13 seasons, joining Rickey Henderson (?rst 23 seasons, 1979-2001) and Ozzie Smith (first 16 seasons, 1978-93)...Has played in a ML-high 2,204 games during 14 seasons. Combined to miss only 35 games in ?rst 12 ML seasons (2001-12). Played in 1,749 of Seattle's 1,782 games from 2001-11, including 1,733 starts (97.3 percent)...Has played in at least 155 games in 11 different seasons, tied for ?fth-highest total in ML history behind Cal Ripken (15), Pete Rose (15), Eddie Murray (12) and Billy Williams (12). Hit .262 (136-for-520) with 15 doubles, 3 triples, 7HR and 35RBI in 150 games (109 starts in RF, nine in CF, eight in LF and two at DH) with the Yankees... His 136H were his fewest in any season of his Major League career, snapping his stretch of recording at least 150H in each season from 2001-12... Batted fifth in the Yankees' starting lineup in three straight games (5/3-5 vs. Oakland) after never previously hitting in that slot in the Majors... Went hitless in a career-high-tying five straight games from 5/11-15 (third time, also 7/1-6/12 and 7/31-8/5/05, both with Seattle)… snapped an 0-for-22 stretch with a seventh-inning single in 5/16 loss vs. Seattle... Hit a solo HR and was 3-for-4 with 2R and 3RBI in 6/19 Game 1 win vs. the Dodgers… was his first home run at Yankee Stadium in 2013 and his first overall homer since 5/10 at Kansas City, snapping a 115AB homerless stretch... Hit ninth-inning "walk-off" solo HR and was 2-for-5 in 6/25 win vs. Texas… was his second career "walk-off" home run (also 9/18/09 vs. the Yankees w/ Seattle off Mariano Rivera)… was his first "walk-off" hit as a Yankee and the fifth such hit of his career (first since 6/2/10 vs. Minnesota)... Played in his 2,000th career Major League game in 7/14 loss vs. Minnesota, hitting a solo HR and going 3-for-5 with 2R and 2RBI... Recorded his 4,000th career hit (2,722 in the Majors and 1,278 in Japan) with a first-inning single to left off R.A. Dickey and was 1-for-4 in 8/21 win vs. Toronto… became the third player to reach the 4,000-hit plateau when considering hits from the highest levels in the U.S. and Japan-also Pete Rose (4,256) and Ty Cobb (4,191)... Snapped a 131AB homerless stretch dating back to 7/14 with a two-run HR in 8/30 win vs. Baltimore. Batted .283 (178-for-629) with 77 R, 28 doubles, 6 triples, 9 HRs, 55 RBIs and 29 SB in 162 combined games between Seattle and the Yankees...was acquired by the Yankees along with cash considerations from Seattle in exchange for RHPs D.J. Mitchell and Danny Farquhar on 7/23...Played in 162 games in 2012, tying the Cubs' Starlin Castro, Detroit's Prince Fielder and Baltimore's Adam Jones for the Major League lead...has played in at least 155 G in 11 different seasons, tying for the fifth-highest total in Major League history behind Cal Ripken-15, Pete Rose-15, Eddie Murray-12 and Billy Williams-12...Hit .322 (73-for-227) with 28 R, 13 doubles, 1 triple, 5 HRs, 27 RBIs, 5 BB and a .340 OBP in 67 games with the Yankees...Made 56 starts in LF (26), RF (24), CF (five) and DH (one) with the Yankees...had made just one start in LF in his career prior to 2012 (2001 ALCS Game 5 w/ Seattle at the Yankees)...according to Elias, had started 1,798 Major League games in the outfield prior to the game (1,533 in RF, 265 in CF)...the last player to start in LF for the first time in the regular season after starting as many games at other OF positions was Kenny Lofton (1,932 GS in CF and RF) before starting in LF for the 2007 Cleveland Indians...His 73 H after the trade mark the most by a Yankees midseason acquisition who played for another team since David Justice had 84 H for the 2000 Yankees after being acquired from Cleveland...Hit 5 HRs (all at Yankee Stadium) in 58 G with the Yankees after hitting 4 HRs in his first 95 G to start the year with Seattle...Opened the season with Seattle...in 95 games (93-RF/2-DH), batted .261 (105-for-402) with 49 R, 15 doubles, 4 HRs, 28 RBIs and 15 SB (in 17 attempts)...Went 4-for-5 in Seattle's Opening Day win vs. Oakland in Tokyo on 3/28...tied the Mariners' Opening Day record for hits (also Ken Griffey Jr. on Opening Day in 1990)...owns a Mariners-record 17 OD hits...Began the season batting .338 (26-for-77) with nine multi-hit games over his first 18 road games...Recorded his 100th career outfield assist in 5/11 loss at Yankee Stadium, throwing out Robinson Cano at second base...had the day off on 5/30 at Texas, snapping streak of 150 straight games played (since 6/11/11)...Homered twice in 6/2 win at Chicago-AL for his first multi-homer game since 8/21/10 at Yankee Stadium...Collected the 2,500th hit of his MLB career in 6/19 win at Arizona as part of a 4-for-5 day...Made his Yankees debut in 7/23 win at Seattle, batting eighth and playing right field...with 2,533 H, had the third-highest total by any player at the time of his debut for the Yankees, behind only Paul Waner (3,151 in 1944) and Ivan Rodriguez (2,584 in 2008)-credit: Elias...Hit safely in each of his first 12 G as a Yankee from 7/23-8/5, the longest hitting streak by a Yankee acquired during the season and tying the longest hitting streak for any player to begin his Yankees career (also Don Slaught - 1988)...Had exactly 1 H in each of the 12 games, a franchise record for most consecutive games with exactly one hit...did not strike out during the stretch, marking the longest streak of "one-hit" games with zero strikeouts by any Major League player in the Live Ball Era (surpassed Enos Slaughter-1939 and Yogi Berra-1953 who each had 10-game stretches with exactly 1 H and 0 K)...According to Elias, was the longest streak of its kind in the Majors since Willy Aybar had exactly 1 H in 13 consecutive games in 2006 w/Los Angeles-NL...Batted in the leadoff position for the first time as a Yankee in 7/25 win at Seattle, going 1-for-5...Hit solo HR - his 100th career HR and first as a Yankee - and was 1-for-4 with 1 SB in 7/30 loss vs. Baltimore...snapped a 188-AB homerless stretch...Struck out in his second at-bat in 8/6 loss at Detroit, snapping a stretch of 55 consecutive plate appearances without a K...also snapped a stretch of 49 plate appearances without a walk or strikeout since joining the Yankees...according to the Elias Sports Bureau, marked the longest such streak for a Yankee since Steve Sax, who went 55 PA without walking or striking out in 1991...Tied his career high with 5 RBIs in 8/10 win at Toronto (also 9/20/03 at Oakland and 8/17/04 at Kansas City, both with Seattle)...started the game in CF, his first appearance at the position since starting there on 6/15/08 vs. Washington (w/ Seattle)...Batted .526 (10-for-19) with 4 R, 1 double, 1 triple, 2 HRs and 2 RBIs in seven games (six starts) on the Yankees' seven-game homestand from 8/13-19...Hit his 300th career double in the eighth inning of 8/16 loss vs. Texas...collected his first three-hit game with the Yankees in the contest, going 3-for-3 with 1 R...Hit two solo HRs in 8/19 win vs. Boston, recording his seventh career multi-HR game and second of the season (also 6/2 w/ Seattle at Chicago-AL)...was his second career multi-HR game at the current Yankee Stadium (also 8/21/10 w/ Seattle-2 HR off Javier Vazquez)...came as the No. 8 batter in the starting lineup, becoming the third different Yankee to record a multi-homer game as the eighth batter (also Russell Martin on 6/10 vs. the Mets and Eric Chavez on 4/20 at Boston)...Batted .385 (35-for-91) in September, trailing only Minnesota's Joe Mauer (.388) for the highest September batting average in the AL...also had 9 SB during the month, his highest stolen base total in a calendar month since April 2011 (10 SB)...Hit safely in 10 straight games (with an at-bat) from 9/15-26, batting .465 (20-for-43) with 10R, 4 doubles, 2 HRs and 5 RBIs over the stretch...recorded multiple hits in a season-high five straight games from 9/19-22...Collected 9 H in the three-game series vs. Toronto from 9/19-20, marking the ninth time in his career he collected at least 9 H in a three-game series and first since 5/15-17/07 vs. Los Angeles-AL (also 9 H)...according to the Elias Sports Bureau, became the first player in franchise history to record at least 9 H, 1 HR and 4 SB in a series of three or fewer games, and the first Major Leaguer with such a series since Colorado's Ellis Burks in Sept. 1996 vs. Atlanta (10 H, 1 HR, 4 SB in three games)...Combined to go 7-for-8 in both games of 9/19 doubleheader vs. Toronto...marked the first time he collected at least 3 H in each of two games on the same day...was his third time collecting at least 6 H in a doubleheader: also 6/8/03 at the Mets (6-for-11) and 8/3/04 at Baltimore (6-for-6)...became the seventh Yankee since 1969 to record at least 3 H in each game of a doubleheader, joining Derek Jeter (2008), Johnny Damon (2006), Willie Randolph (1987), Dave Winfield (1983), Matty Alou (1973) and Roy White (1972)...according to Elias, became the fourth player in the Modern Era (since 1900) to record at least 7 H and 4 SB on one day: also the Dodgers' Maury Wills on 8/7/60 (7 H/4 SB), and Detroit's Johnny Neun on 7/9/27 (7 H/5 SB) and Ty Cobb on 10/2/1907 (7 H/4 SB)...Was 4-for-4 with 1 double, 1 RBI and 4 SB in 9/19 Game 2 win vs. Toronto...tied his career high in SB (third time) and recorded his second career game with at least 4 H and 4 SB (also 7/20/04 vs. Boston)...became the first Major Leaguer with at least 4 H and 4 SB in the same game since Texas' Julio Borbon on 8/15/09 vs. Boston...also joined Rickey Henderson (4/11/88 at Toronto - 5 H, 4 SB) as the only players in franchise history to accomplish the feat...along with Kenny Lofton (twice), Rickey Henderson (twice) and Carl Crawford (twice), are the only players with multiple such games in the Live Ball Era...became the first Yankee to steal four bases in a game since Tony Womack did so twice in May 2005...was 3-for-4 with 2 R and 1 double in 9/19 Game 1 win vs. Toronto...Hit solo HR and was 2-for-4 with 2 R, 1 double and 3 RBIs in 9/20 win vs. Toronto...hit safely in seven consecutive plate appearances from his final PA in 9/19 Game 1 win through his fourth-inning double on 9/20 (all off four different LHP)...marked the most consecutive PA with a hit by a Yankee since Bernie Williams did so in nine straight PA from 8/14-16/02 (credit: Elias)...Was named AL "Player of the Week" for the period ending 9/23...during the stretch, batted a Major League-leading .600 (15-for-25) with 7 R, 3 doubles, 2 HRs, 5 RBIs and 6 SB with five multi-hit games in six contests...was his fourth career "Player of the Week" award and first since September 2010...Hit .394 (28-for-71) with 14 R, 6 doubles, 2 HR, 9 RBIs, 2 BB and 8 SB over his last 16 games of the season...Batted .275 (11-for-40) with 3 R, 2 doubles, 1 HR and 5 RBIs in nine postseason games with the Yankees in 2012...collected 4 H in ALCS Game 1 vs. Detroit, the most in a playoff game by a Yankee since Derek Jeter went 5-for-5 in 2006 ALDS Game 1 vs. Detroit...marked the most hits by a Yankee in an ALCS game since 2004 - Hideki Matsui (4-for-5) and Gary Sheffield (4-for-5) in Game 3 at Boston. Ranked amongst AL leaders in several offensive categories: Games (161, T1st), At-bats (677, 1st), Stolen Bases (40, 3rd), Singles (154, 3rd), Plate Appearances (721, 4th), Multihit Games (59, T5th), Intentional Walks (13, T6th) and Hits (184, 9th)...Had string of 10 consecutive 200-hit seasons snapped...tied with Pete Rose for most 200-hit seasons in a career...led Majors in hits in each of 5 previous seasons...Recorded career-lows in hits (184 - previous low was 206 in '05) and batting average (.272 - previous low was .303 in '05)...had string of 10 consecutive seasons batting .300 and named an All-Star snapped...Set Mariners all-time hits record on the 10th anniversary of his Major League debut April 2 at Oakland (debuted 4/2/01)...passed Edgar Martinez with career hit 2,248 on a 9th inning infield single...joins Todd Helton (COL-2,363), Derek Jeter (NYY-3,088) and Michael Young (TEX-2,061) as active players who are their current team's all-time hits leader...Hit 4 leadoff home runs, T5th-most in the Majors (6/28 vs. ATL, 8/13 vs. BOS, 8/22 at CLE, 9/8 vs. KC)...36 career leadoff ranks 6th all-time...Recorded 10 leadoff extra base hits (2B - 5, HR - 4, 3B - 1)...has 129 leadoff XBH in his career (2B - 78, HR - 36, 3B - 15), most among active players and 4th-most dating back to 1974: 1. R. Henderson - 215, 2. C. Biggio - 168, 3. P. Molitor - 130...Notched 59 multi-hit games, T5th in the AL...11th season (consecutive) with at least 50 multi-hit games, ranking 5th-best over the last 70 years: 1. P. Rose - 15, 2. S. Musial - 14, 3. T. Gwynn - 13, 3. D. Jeter - 13, 5. Ichiro - 11...11 consecutive50+ multi-hit games ranks 3rd-best during the same time frame: 1. S. Musial - 14 (1943-57, DNP in '45), 2. T. Gwynn - 12 (1984-95), 3. Ichiro - 11 (2001-11)...Ranked 3rd in AL with 40 stolen bases (in 47 att. )...5th season with 40+ steals and 11th straight with 25+...only the second player in club history to record back-to-backseason with 40+ steals (also: Julio Cruz, 1979-82)...since 2001, is one of 4 players to record at least 5 seasons with 40+ SB: 1. J. Pierre (9), 2. C. Crawford (7),T3. Ichiro (5) and C. Figgins (5)...Did not play June 10 at Detroit, snapping string of 255 consecutive games played dating back to Sept. 1, 2009 (3rd-longeststreak in club history). Recorded three double-digit hitting streaks (13 G - Aug. 17-30, 11 G - June 11-23, 10 G - Aug. 3-14)...has 40 single-season hitting streaks of at least 10 games in his career...dating back to 1918, records show that Ichiro has the 5th most (tied) double-digit hitting streaks: 1. Ty Cobb (65), 2. Hank Aaron (44), 3. Al Simmons (42), 4. Stan Musial (41), 5. Ichiro (40), Derek Jeter (40) and Pete Rose (40)...Tied for team lead with 7 OF assists (T14th in AL)...recorded 97 career OF assists, tied for ML lead since his debut in 2001 (also: Carlos Beltran & Jeff Francoeur)...Made 10th career Opening Day start (RF),T3rd-most in club history (Edgar - 15, Griffey Jr. - 13, Dan Wilson - 10)...Recorded MLB hit #2,400 Sept. 1 vs. LAA...has 2,428 MLB hits, 8th-most among activeplayers and T109th all-time...3,706 all-time hits counting career in Japan...Made 10 starts at designated hitter (151 in RF)...hit .341 (14x41) as a DH in 2011, and is a career .361 hitter (56x155) in 36 starts at DH...Recorded pair of stolen bases June 15 vs. LAA, #400 & #401 in MLB, #600 in pro career (199 SB in Japan)...Recorded season-high 4 hits (3x, last: 9/9 vs. KC)...has 46 career 4+ hit games in his career...since his debut in 2001, leads all players in 4+ hit games (Albert Pujols is 2nd w/37)...1st among all active players with 46 4+ hit games (Ivan Rodriguez is 2nd with 44)...Combined for 3,706 hits in his professional career (MLB - 2,428; Japan - 1,278)...only Pete Rose (4,256), Ty Cobb (4,191) and Hank Aaron (3,771) have more career hits. Recorded his 10th consecutive200-hit season and named tohis 10th consecutive All-StarGame (9th as starter)....Won 10th consecutive GoldGlove...tied the AL record withKen Griffey Jr. and Al Kaline...6th OF and 16th positionplayer with 10 GG in a career....Led the Majors in hits (214) forthe 5th consecutive season,and 7th time in his career (2001-242, '04-262, '06-224, '07-238, '08-213, '09-225, '10-214)...tied ML record with Ty Cobb and Pete Rose as the only players to lead the Majorsin hits 7 seasons in a career...is the only player to lead the AL or NL in hits in 5 straightseasons...has led the AL in hits in 7 of 10 seasons (record is 8 by Ty Cobb)....Recorded 200th hit Sept. 23 at Toronto (G#152)...tied Pete Rose for most 200-hitseasons in a career (10), breaking the AL record of 9 by Ty Cobb...already holds recordfor consecutive 200-hit seasons in a career....Led the AL in hits (214), multi-hit games (69), games (162), infield hits (59), singles (175)and at-bats (680)...also T5th in stolen bases (42) and 7th in batting average (.315)....Named American League Player of the Week for Sept. 20-26, his 3rd AL weekly honor...hit .444 (12x27), 4 R, 2 2B, 2 BB, 2 K....Started all 162 games (RF - 160, DH - 2), tying Matt Kemp (LAD) for Major League lead...played in 192 consecutive games, the longest active streak in the AL (2nd in Majorsbehind Kemp - 202) and T8th-longest in club history....Recorded at least one hit in 130 of 162 games...reached base safely in 137 games...hasnot gone hitless in 3 consecutive games since May 2007....Notched 10th consecutive season batting at least .300 with 25 steals...becomes the 4thplayer during the modern era (since 1901) to record as many consecutive .300, 25 SBseasons (Ty Cobb - 13, Honus Wanger - 12, Ichiro - 10, Tris Speaker - 10)....Named to 10th consecutive All-Star game (went 0x2), the longest active streak in theMajors, tying Ken Griffey Jr. as the franchise leader in consecutive All-Star selections(1990-99)...9th time to start Midsummer classic in leadoff position, breaking the all-timerecord set by Willie Mays and Rod Carew....Tied career-high with 4 stolen bases Aug. 4vs. Texas (also: 7/20/04 vs. BOS)...recorded4th career 40-steal season...the 11th playerwith a 40-steal season at age 35 or older,first since Ricky Henderson in 1997-98....Recorded 4 double-digit hitting streaks,including season-high 14-gamer June 29-July 15...has 37 double-digit hitting streaksin his career, 2nd-most among activeplayers (Derek Jeter - 39)....Combined for 3,522 hits in his professionalcareer (MLB - 2,244; Japan - 1,278)...onlyPete Rose (4,256), Ty Cobb (4,191), HankAaron (3,771) and Stan Musial (3,630) havemore career hits.Recorded his 10th consecutive200-hit season and named tohis 10th consecutive All-StarGame (9th as starter)....Won 10th consecutive GoldGlove...tied the AL record withKen Griffey Jr. and Al Kaline...6th OF and 16th positionplayer with 10 GG in a career....Led the Majors in hits (214) forthe 5th consecutive season,and 7th time in his career (2001-242, '04-262, '06-224, '07-238, '08-213, '09-225, '10-214)...tied ML record with Ty Cobb and Pete Rose as the only players to lead the Majorsin hits 7 seasons in a career...is the only player to lead the AL or NL in hits in 5 straightseasons...has led the AL in hits in 7 of 10 seasons (record is 8 by Ty Cobb)....Recorded 200th hit Sept. 23 at Toronto (G#152)...tied Pete Rose for most 200-hitseasons in a career (10), breaking the AL record of 9 by Ty Cobb...already holds recordfor consecutive 200-hit seasons in a career....Led the AL in hits (214), multi-hit games (69), games (162), infield hits (59), singles (175)and at-bats (680)...also T5th in stolen bases (42) and 7th in batting average (.315)....Named American League Player of the Week for Sept. 20-26, his 3rd AL weekly honor...hit .444 (12x27), 4 R, 2 2B, 2 BB, 2 K....Started all 162 games (RF - 160, DH - 2), tying Matt Kemp (LAD) for Major League lead...played in 192 consecutive games, the longest active streak in the AL (2nd in Majorsbehind Kemp - 202) and T8th-longest in club history....Recorded at least one hit in 130 of 162 games...reached base safely in 137 games...hasnot gone hitless in 3 consecutive games since May 2007....Notched 10th consecutive season batting at least .300 with 25 steals...becomes the 4thplayer during the modern era (since 1901) to record as many consecutive .300, 25 SBseasons (Ty Cobb - 13, Honus Wanger - 12, Ichiro - 10, Tris Speaker - 10)....Named to 10th consecutive All-Star game (went 0x2), the longest active streak in theMajors, tying Ken Griffey Jr. as the franchise leader in consecutive All-Star selections(1990-99)...9th time to start Midsummer classic in leadoff position, breaking the all-timerecord set by Willie Mays and Rod Carew....Tied career-high with 4 stolen bases Aug. 4vs. Texas (also: 7/20/04 vs. BOS)...recorded4th career 40-steal season...the 11th playerwith a 40-steal season at age 35 or older,first since Ricky Henderson in 1997-98....Recorded 4 double-digit hitting streaks,including season-high 14-gamer June 29-July 15...has 37 double-digit hitting streaksin his career, 2nd-most among activeplayers (Derek Jeter - 39)....Combined for 3,522 hits in his professionalcareer (MLB - 2,244; Japan - 1,278)...onlyPete Rose (4,256), Ty Cobb (4,191), HankAaron (3,771) and Stan Musial (3,630) havemore career hits. Recorded his record-breaking9th consecutive 200-hitseason, named to his 9thconsecutive All-Star Game(8th as a starter) and won 9thstraight Gold Glove...added3rd career Silver SluggerAward...Earned Fielding Bible Awardas top fielding right fielder inbaseball...Set ML record with 5th season of at least 220 hits...Hall of Famers Rogers Hornsby andJesse Burkett each had 4 seasons of 220+ hits...Named to the Sporting News American League All-Star team...Led the AL in hits (225), multi-hit games (73), infield hits (59), intentional walks (15) andday batting average (.400)...also ranked 2nd in batting avg (.352) and had the longesthitting streak in the AL (27 games)...Hit 11 home runs, 2nd-most of his career (15 in '05)...31 doubles were 3 shy of careerhigh(34 in '01) and 46 extra base hits were 4th-most in his career...Has led the AL in hits in 6 of 9 seasons (record is 8 by Ty Cobb)...became first player tolead a league (AL or NL) in hits 4 consecutive seasons...first to lead the Majors in hits 4consecutive seasons (previous record was 2 by 9 players -- last Tony Gwynn, 1994-95)...Led the Majors in hits for the 6th time in his career (2001-242, '04-262, '06-224, '07-238, '08-213, '09-225)...joins Ty Cobb-7 and Pete Rose-7 as the only players during themodern era to lead the Majors in hits 6-or-more seasons in a career...Recorded hit #200 in G#2 Set. 13 at Texas with infield single...first player in MLB historyto record 9 consecutive 200-hit seasons...tied the AL record for 200-hit seasons in acareer with Ty Cobb...Pete Rose holds the all-time record with 10 200-hit seasons...Tallied career hit #2,000 with leadoff double Sept. 6 at Oakland...reached the milestone in1,402 career games, 2nd-fastest in history (Al Simmons, 1,390 games)...Named to 9th consecutive All-Star game, the longest active streak in the Majors and oneshy of Ken Griffey Jr. as the franchise leader in consecutive All-Star selections (1990-99)...8th time to start Midsummer classic in leadoff position, tying the all-time record byWillie Mays and Rod Carew...Club-record 27-game hitting streak,May 6-June 3 (.398/47x118)...broke hisown record of 25 games set in 2007...only the 3rd player with 2 streaks of 25or more games in the last 20 seasons(Nomar Garciaparra and VladimirGuerrero)...was his 7th career 20-gamestreak, tied with George Sisler for 4thmost20+ game hitting streaks all-time,just one streak shy of all-time mark of 8(Keeler, Cobb, Rose)...Recorded 22-game home hitting streak,June 6-Aug. 7 (.474/46x97)...longesthitting streak in Safeco Field historyand T2nd-longest home hitting streak in club history (H. Reynolds, 25 G, 1991)...19 games with 3+ hits...199 career gameswith 3+ hits since his debut in 2001, 46more than any other player (Jeter - 153)...most 3-hit games over a 9-year span sinceAl Simmons had 206 from 1925-33...Held hitless in consecutive games Sept. 26-27, snapping a string of 180 consecutivegames without going hitless in back-tobackgames... he was previously heldhitless in consecutive games Aug. 13-15,2008 (last 41 of '08, first 139 of '09)...the180-game streak was the longest since DocCramer in 1934-35 (192 G)...recorded atleast one hit in 128 of 146 games in '09...On the disabled list from March 31-April 15with severe fatigue (stomach ulcer)...missed first Opening Day, having his string of 197consecutive games played snapped...Missed 16 games during the season, after missing only 16 games in previous 8 seasonswith the Mariners...has played in 1,426 games since debut (most in MLB), missing only32 out of a possible 1,458 games...Ejected on Sept. 26 at Toronto by home plate umpire Brian Runge for arguing balls andstrikes...first career ejection...Led the Majors in singles (179) for the 8th time in his career (ML record) and 6th straightseason...led AL in singles in each of his 9 seasons...Recorded a hit in 60 of 63 games, May 6-July 17 (.383/106x277)...first player since JoeDiMaggio in 1941 (hit in 75 of 78) to record at least one hit in 60 of 63 games...Tied career-high with 7 consecutive multi-hit games (4th time), June 20-27 (.594/19x32)...one off club record held by Desi Reliford (2002)...Led Majors with 73 multi-hit games...5th time to post 70 or more multi-hit games in aseason...622 multi-hit games are the most over a 9-year span during the live-ball era(since 1920)...the 2nd-highest total is 581 by Rogers Hornsby (1920-28, 1921-29)...Reached base safely in career-high 43 consecutive games (4/28-G#2-6/14)...streak wasT2nd-longest in club history (47 G - Alvin Davis, 1984; 43 G - Edgar Martinez, 2001)...Belted career leadoff HR #30 Aug. 4 at KC...T10th all-time with Tony Phillips...Tied (4/15 vs. LAA) and broke (4/16 vs. LAA) the all-time Japanese hits record with 3,086career hits, passing Isao Harimoto...Hit 28th career leadoff home run in Mariners 1-0 victory over the Rays on April 23...marked the 22nd time in ML history and 2nd in Mariners history for a leadoff homer tostand as the only run in a 1-0 victory (Greg Briley, 6/19/92 at MIN)...Recorded 26 steals, fewest season total of his career...recorded SB#20 July 19 atCleveland, becoming 9th player to steal 20 or more bases in each of his first 9 seasons...Made season debut April 15 vs. the Angels, going 2-for-5 with a grand slam...4th careergrand slam (first since 8/25/05 at TEX)...became 4th Mariner to hit a grand slam home runin his first game of the season...also: Jay Buhner (6/1/90 vs. DET), Jim Presley (4/8/86 vs.CAL) and Leon Roberts (4/9/78 vs. MIN)...Led the AL with 15 intentional walks...3rd time to lead the AL in IBB...recorded only32 total walks, the fewest by eitherleague's IBB leader since the stat wasfirst tracked in 1955...previous record:39, by Garry Templeton in 1984 Recorded 3 walk-off hits...first careergame-ending hit July 28 vs. Toronto,his 1,953rd career hit (came in 91stpossible walk-off at-bat)...had gameendinghits in back-to-back games,Sept. 17 vs. CWS (1B) and Sept. 18vs. NYY (2-run homer off M. Rivera)...Helped lead Japan to the World Baseball Classic title for the second time(also 2006)...batted .273 (12x44) with 7 runs,2 doubles, one triple and 5 RBI in 9 games...recorded GWRBI with 2-run single in the 10thinning vs. Korea in the Championship. Recorded 8th consecutive 200-hit season, named to his 8th consecutive All-Star Game (7th as a starter), won 8th straight gold glove and scored 100 runs for the 8th straight season...Tied for the Major League lead with Dustin Pedroia with 213 hits...213 hits are T6th-most in club history...became the first player to lead the Majors in hits (either outright or tied) in each of three consecutive seasons...has led the AL in hits in 5 of 8 seasons...became first player to lead the AL in hits in three consecutive seasons since Kirby Puckett (1987-89)...Led the Majors in hits for the fifth time in his career (2001-242, '04-262, '06-224, '07-238, '08-213)...joins Ty Cobb-7, Pete Rose-7, Stan Musial-5 and Tony Gwynn-5 as the only players during the modern era to lead the Majors in hits 5-or-more seasons in a career...Set the modern Major League record with his eighth consecutive 200-hit season...joins Willie Keeler (1894-1901) as the only other player in history to record 8 consecutive 200-hit seasons...became only the sixth player in history to record 8-or-more 200-hit seasons in a career...Tied Lou Gehrig's modern ML record by recording at least 200 hits and 100 runs in eight seasons in a career...Ichiro and Willie Keeler (1894-1901) are the only players to achieve this in consecutive seasons...Made 8th consecutive trip to the All-Star game, starting in right field and batting leadoff...7th time in his career to start the Mid Summer Classic...went 1-for-3 with an outfield assist...AL won 4-3 in 15 inn...Tied for the AL lead in hits (213), and ranked 7th in batting average (.310), 3rd in multi-hit games (58) and 7th in runs (103)...also ranked in the top 10 in the AL in batting average on the road (.305/10th), batting average vs. RHP (.320/5th), at-bats (686/1st), intentional walks (12/T5th), hardest to strikeout (11.5/5th), hardest to double-up (85.8/6th) and games played (162/T2nd)...Appeared in all 162 games, making 161 starts (CF-69, RF-90, DH-2)...has played in 197 consecutive games dating back to Aug. 26, 2007, the 5th-longest active streak in the Majors...has played in 807 of the Mariners last 810 games over the last five seasons...Hit HR#4 July 19 vs. Cleveland, snapping a string of 40 consecutive singles and 136 plate appearances without an extra base hit...Ranked 3rd in the AL with 43 stolen bases (34 prior to All-Star break, 9 post-ASG)...third time in his career to surpass 40 steals in a season...Recorded his 300th career stolen base June 11 at Toronto...one of just 28 players to record 300-or-more steals in the first 8 seasons of career...also just the 16th player in ML history with 8 consecutive seasons of 30-or-more steals...only Ricky Henderson (15) has more consecutive seasons of 30-or-more steals to open a career...Career SB#291 on May 18 vs. San Diego, breaking Julio Cruz's franchise record...recorded 18 SB in May, most in any month of his career...Recorded Major League hit #1,800 Sept. 25 vs. LAA...reached the milestone in 1,277 career games, fastest by any player since Al Simmons reached the milestone in 1,242 games...also recorded career hit #1,600 (4/8 at BAL) and #1,700 (7/3 vs. DET) ...Reached 3,000 hits for his career (Japan + Mariners) July 29 at Texas...has recorded 1,805 hits in 1,280 games with Seattle, coupled with 1,278 hits with the Orix Blue Wave...Led the Majors with 180 singles...set ML record with 7th season leading the Majors in singles...Named the Mariners winner of the 2008 Heart and Hustle award given annually by the Major League Baseball Players Alumni Association...award honors an active player who "demonstrates a passion for the game of baseball and best embodies the values, spirit and tradition of the game. "...Went 5-for-5 on June 29 at San Diego, tying a single-game career-high in hits...7th career 5-hit game, T3rd-most by any player since 1956...has recorded 37 games with 4-or-more hits, the most over any 8-year span since the period from 1985-92 when Wade Boggs had 38 and Kirby Puckett had 37...Season-high 17-game hitting streak, July 26-Aug. 12 (.395/30x76)...also had a 16-game streak Sept. 7-23 (.338/23x68)...has recorded 29 career hitting streaks of 10-or-more games in his career...Moved into 2nd place on Japan's all-time hit list on May 1 after going 3-for-5 at NYY...needs 3 hits to set all-time Japan hits record (Isao Harimoto, 3,085)...Ranked T5th in the AL with 11 outfield assists...since 2001, has recorded 78 outfield assists, most in the AL and 4th-most in the Majors...recorded career-high 5 errors...Hit leadoff home runs April 7 at Baltimore and Aug. 9 vs. Tampa Bay...27 career leadoff HR, 14th All-Time. Finished second in the AL batting race at .351 (238x678) behind Magglio Ordoñez (.363)...became the only active player to record three full seasons hitting .350-or-higher (.350 in 2001, .372 in 2004)...named MVP of All-Star game in San Francisco...went 3-for-3 with the first inside-the-park home run in ASG history...2nd Mariner to win ASG MVP honors (Ken Griffey Jr. - 1992)...first Mariner to homer in an ASG since Alex Rodriguez in 1998 (at Colorado)...4th leadoff hitter in ASG history to be named MVP (Bo Jackson - 1989, Joe Morgan - 1972, Willie Mays - 1968)...also among AL leaders in infield hits (53/1st), stolen bases (37/T4th), runs (111/8th), on-base percentage (.396/9th), hitting streak (25/2nd), intentional walks (13/T3rd), batting average at home (.365/T4th), batting average on the road (.337/5th), RISP batting average (.397/2nd), batting average during the day (.341/T5th), batting average at night (.355/3rd), batting average vs. RHP (.358/1st), games played (161/T3rd) and toughest to double-up (96.9 AB per GIDP/6th)...238 hits ranked T16th in ML history...became the first player in the modern era (since 1900) to record three seasons of 230-or-more hits...joins Freddy Lindstrom (1928, 1930) and Rogers Hornsby (1921-22) as only players with at least two seasons of 230+ hits...played 1,000th career MLB game May 24 at Tampa Bay...1,414 hits in first 1,000 MLB games ranked 2nd all-time since 1900 (Al Simmons, 1,443)...recorded career-high and club record 25-game hitting streak May 7-June 1 (.411/46x112)...broke old record of 24 games by Joey Cora set in 1997...recorded at least one hit in 56 of 59 games (May 7-July 8), batting .399 (101x253) during that stretch...set AL record with 41st consecutive stolen base on May 3 at Boston...streak ended at 45 consecutive steals (5/17), falling short of ML record of 50 set by Tim Raines...hit four leadoff HR (4/15 vs. TEX, 4/17 vs. MIN, 5/25 at KC, 7/6 vs. BAL)...recorded seven consecutive multi-hit games May 13-20 (.567/17x30), falling one short of club record (Desi Relaford)...hit in seven consecutive plate appearances May 13-16...set club record for highest FLD% as CF (.998)...made one error (9/12 vs. OAK) in 433 total chances...signed 5-year contract extension (thru 2012) on July 13. Ichiro saw his streak of consecutive games played end at 396. Ichiro collected his 200th hit of the season against Kansas City on Sept. 16. He swiped 39 consecutive bases without being caught -- a new club record and an American League single-season record. Ichiro, who had 224 hits, led the American League in hits for the third time in his career. Recorded his fifth consecutive 200-hit season, collected his fifth straight Gold Glove, was named to his fifth consecutive All-Star Game and scored 100 runs for the fifth straight year...First player in ML history to record at least 200 hits in first five seasons...became only the sixth player in ML history to record five consecutive 200-hit seasons...Among the AL leaders in at-bats (679/1st), hits (206/2nd), triples (12/2nd), intentional walks (23/2nd), multi-hit games (60/3rd), batting average vs. LHP (.352/3rd), steals (33/5th), runs (111/T8th) and outfield assists (10/T4th)...One of six AL players (including Raul Ibanez) to play in all 162 games...Set new club record with 12 triples (prev: H. Reynolds, 11 in 1988)...Collected career hit #1000 on June 14 vs. PHI (single in 1st, off Jon Lieber) to become the third player since 1900 with 1,000 hits in less than 700 games (696); also the third player to collect 1,000 hits in first five seasons...Plated 500th run June 25 at San Diego in his 707th game...Was 1-for-2 with 2 RBI in All-Star Game in Detroit; played centerfield and rightfield...Third 0x6 of career July 31 vs. CLE (also: 6/22/05 vs. OAK & 7/22/03 at MIN)...Batted .364 (40x110) in July, hitting safely in 23 of 27 games...Third career 2-HR game July 30 vs. CLE (first since 6/17/03 vs. ANA)...Ended longest slump of career (0x22) August 6 at CWS...Hit in season-high 13-straight games Aug. 6-19...Hit third career grand slam homer in the 9th inning on Aug. 25 at TEX...Hit fifth lead-off home run of season, 17th of career, Aug. 29 vs. NYY...Homered in consecutive games for second time in career, Aug. 29-30...Hit six home runs in Aug., a career-high monthly total (prev: 4, 8/04 & 5/03)...Became third player in '05 to get three IBB's in game Sept. 27 (also: Guerrero, Delgado); three intentional walks matched club record...Recorded 200th hit of season in 2nd inning off Oak's Kirk Saarloos Sept. 30...Had second 4-hit game Sept. 30 vs. OAK (also: 9/10 vs. Balt. )...24th career 4+ hit game. Established all-time ML single-season hit record with 262 hits, passing George Sisler's mark of 257 hits (1920)...also established the all-time ML mark for most hits over any four-year span, with 924...previous mark was 918 by Bill Terry (1929-1932)...his 262 hits were 46 more than AL runner-up (Michael Young, Tex. - 216), the largest hit differential ever in one league by a first- and second-place finisher...previous mark was 44, by Stan Musial (228) over Dixie Walker (184) in the NL in 1946...became first player ever with 200 hits in each of first four years in the Majors...led the Majors, and established a club record with .372 batting average...5th Mariner to win a batting title, and second Mariner to win two batting titles (Edgar Martinez, 1992, 1995)...set club record with 80 multi-hit games, the most in the Majors during the Division Play era (1969)...set ML record for most singles with 225...led Majors with 57 infield hits...hit three lead-off home runs, extending his club record to 12 career lead-off home runs...lead-off homers came April 30 at Detroit; Aug. 15 vs. New York & Aug. 17 at Kansas City...had a career-high 5 hits four times (July 29 at Ana. ; Aug. 3 at Bal. #1; Sept. 4 at Chi. ; Sept. 21 at Ana. ), becoming just 5th player ever with four 5+-hit games in a season...joins Tony Gwynn, 1993; Stan Musial, 1948; Ty Cobb, 1922; Willie Keeler, 1897...had 50 hits in a month three times (50 in May, 51 in July, 56 in August)...he is the first player with consecutive 50-hit months since Joe Medwick in 1936 (50 in July, 52 in August)...the 56 hits in August were a club record for hits in a month and the most hits in a month by a player since Jeff Heath had 58 hits in August, 1938...became first player with four 50-hit months (also 51 hits in Aug. 2001) in a career since Pete Rose (Aug. 1966; Aug. 1968; July 1973; Sept. 1979)...recorded 36 stolen bases, 2nd in the AL, becoming first Mariner ever with four straight seasons with 30+ stolen bases...reached base safely in 40-straight games, April 29-June 13, a new career-high...collected 2,000th hit of pro career (US & Japan) with single in 5th inning May 21 vs. Detroit...matched club record for right fielders with two outfield assists June 12 vs. Montreal...finished 3rd in the AL with 12 outfield assists...elected to start in All-Star Game; was 1x4 with one run scored in Mid-Summer Classic in Houston...led ML with 704 at bats, just the 3rd player ever with 700 at bats in a season, joining Willie Wilson (705 in 1980) & Juan Samuel (701 in 1984)...led AL (2nd in Majors) with .372 batting average with runners in scoring position (45x121)...led AL with 19 intentional walks...also was third-hardest player to strikeout (12.1 PA/K) and 4th-toughest to double-up (117.3 AB/GIDP)...had a 21-game hit streak, tied for 2nd-longest in the AL, July 4-29...third 20+-game hit streak of his career...only game not played was July 10 at Chicago...set career-high with four stolen bases July 20 vs. Boston...tied career-high with 5 RBI Aug. 17 at Kansas City, going 4x4, with a home run and 2 runs scored...left game on Aug. 18 with mild concussion after being hit by a pitch...was 4x7 and a home run short of the cycle Aug. 21 at Detroit...recorded 200th hit of the season, a home run, on Aug. 26 vs. Kansas City, becoming the fastest player, by date, to reach 200 hits in the Division Play era...200th hit came in team-game #126, the fastest to 200 hits in team games since 1930: Bill Terry (#119) and Chuck Klein (#125)...had eight hits in eight at-bats over two games Sept. 21-22...recorded hit #257 & #258 Oct. 1 vs. Texas, both off Ryan Drese, tying and passing George Sisler...hit #257 was a single in the first inning to left field...hit #258 was single in the third inning to center...final hit, #262, came Oct. 3 vs. Texas, a single to center in the 8th inning off Brian Shouse. Led Majors with 66 multi-hit games; also ranked among AL leaders in hits (2nd), batting average (7th), runs (T7th), triples (T8th) and stolen bases (5th)...had 12 outfield assists, fourth-most in the AL...batted .359 (75x209) vs. left-handed pitchers, 3rd-best in the AL and the highest among left-handed hitters...recorded 212 hits, becoming just the third ML player with 200+ hits in each of first three ML seasons...hit .389 (44x113) in May, leading the Majors with 44 hits in the month...had a 13-game hit streak May 8-22 (25x55/.455)...hit lead-off home run May 17 at Detroit, his first of three lead-off home runs on the season (also: June 17 vs. Ana, July 8 vs. Bal)...batted .386 (44x114) in 26 games in June, including a 19-game hit streak June 4-24...hit two home runs, his first career multi- home run game, June 17 vs. Anaheim, going 4x4 with four runs scored...had seven- consecutive multi-hit games July 1-8, going 14x31/.452...led Majors in All-Star balloting for third consecutive season with 2,130,708 votes; was 0x1 with two walks in the Mid- Summer Classic...hit first career grand slam July 18 at Kansas City; slam put Mariners ahead 6-3 in the 9th...hit second career grand slam Aug. 15 vs. Boston...had a career- high 5 RBI Sept. 20 at Oakland, going 4x6 with two doubles...hit just .259 (75x290) after the All-Star break, including .242 (29x120) in August and .273 (30x110) in Sept...struck out just once every 10.5 at bats, the 7th-best ratio in the AL. Finished among AL leaders in hits (2nd), at bats (3rd), multi-hit games (3rd), triples (T3rd), batting average (4th), stolen bases (T4th), runs (9th) and on-base percentage (10th)...also led the AL with 15 caught stealings and a club-record 27 intentional walks... became first Mariner ever with two 200+ hit seasons, and just the 6th player in ML history with 200+ hits in first two ML seasons...set record for most hits in first two ML season with 450...established club record with five lead-off home runs...led the Majors with a .404 batting average (44x109) in May, hitting safely in 25 of 27 games...stole three bases May 10 vs. Boston...batted third for first time in the Majors June 2-4 (8x14), including 4x5 June 2 at Baltimore...hit first lead-off home run of the season June 6 at Oakland...had 15- game hit streak May 22-June 6 (30x63/.476)...hit second lead-off home run June 29 vs. Colorado...was not held hitless in consecutive games until June 7-8 vs. Cubs (0x8)...had 124 hits at the All-Star break, second-most in club history...led Majors in All-Star ballotting (2,516,016 votes) for second straight season; was starting right-fielder in All-Star Game (0x2)...homered twice July 13 at Tampa Bay, his first career multi-home run game, including 3rd lead-off home run...started in center field in three straight games, Aug. 17-19 (4x11), his first games in center in regular-season ML game...hit 4th lead-off home run Sept. 9 at Texas...bases- loaded walk in 11th inning to end game in 6-5 win Sept. 16 vs. Texas...hit 5th lead-off home run Sept. 24 vs. Oakland...led Majors with 54 infield hits, including nine bunt hits...hit .356 (64x180) off left-handers, 4th-best in the AL... batted .361 (43x119) with runners in scoring position, 8th-best in the AL...6th in the AL with a .334 road batting average (109x326)...struck out just once per every 11.7 plate appearances, 4th-best in the AL. Became the first Japanese-born position player to play in the Majors and was voted AL MVP and Rookie of the Year by the BBWAA, becoming just the second player ever to win both awards in the same season (Fred Lynn, 1975)...led the Majors in batting average and stolen bases, the first player to do so since Jackie Robinson (1949)...became just second rookie ever to lead either league in batting, joining Tony Oliva (1964)...set ML rookie record for singles...set AL rookie mark for hits and at bats...set club record with 242 hits, becoming just the third rookie since 1964 to collect 200 hits (Nomar Garciaparra, 1997; Kevin Seitzer, 1987)...his 242 hits were the most in the Majors since 1930...also set club records for most games hit safely (135, tying the ML mark), multi-hit games and infield singles...among league leaders in runs scored, total bases & triples...56 stolen bases led the AL and third-most in club history...was AL Rookie of the Month for April, May, August and September...23-game hit streak April 22-May 18 tied for longest in the Majors (Moises Alou); second-longest in club history...made ML debut April 2, starting in right field and going 3x5...broke a 7-7 tie in the 10th inning with his first Major League home run, a two-run shot (Jeff Zimmerman) in Seattle's 9-7 win April 6 in Texas...recorded first outfield assist of the season (9-5) April 11 in Oakland...had 15-game hit streak April 4-20 (26x65/.400)...was home run short of the cycle in consecutive games, May 12 & 13 in Toronto... tied club record with seven consecutive multi-hit games, May 12-19...had 23-game hit streak April 22-May 18 (44x114/.386)...reached safely in 38 consecutive games before 0x4 June 4 (SF, RBI)...had two hits in the 1st inning June 29... struck out as a pinch-hitter in the top of the 7th inning, before a two-run game-tying home run in the top of the 9th inning (Jeff Zimmerman) in Mariners 9-7 win July 2 in Texas...was home run short of cycle July 3 in Texas...hit 1st lead-off home run July 6 at LA (K. Brown)...batted .347 with a club-record 134 hits in the first half...voted to start All-Star Game; led Majors w/3,373,035 votes; just sixth rookie ever voted to start an All-Star Game (1st since Sandy Alomar in 1990) and first rookie outfielder to start an All-Star Game since Tony Oliva in 1964...started in center field and was 1x3 including an infield single off Randy Johnson in the first inning in the Midsummer Classic...lined out as a pinch hitter Aug. 2 to end 11-game hit streak (18x46)...had 21-game hit streak Aug. 3-24 (42x93/.452)...0x5 Aug. 26 vs. Cleveland snapped 21-game hit streak & streak of hitting safely in 32 previous starts (60x139/.432)...became the first Major League player with three hit streaks of 15 or more games in a season since 1980 (Cecil Cooper) and the first Major Leaguer with two hit streaks of 20+ games since 1996 (Juan Gonzalez)...collected 200th hit Aug. 28 in team game #132; matching Darin Erstad (2000) as fastest in the Majors to 200 hits since Joe Medwick in 1935 (131 games) and the fastest in the AL since Al Simmons in 1925 (125 games)...had a Major League-leading 51 hits in August, just the second Mariner ever with 50 hits in a month (Rodriguez, 54 hits in Aug. 1996). Notched his Japanese-record seventh consecutive batting title, hitting a career-best .387 with the Orix Blue Wave...his season was cut short when he strained a right rib cage muscle on August 28...came back to play the field in the final game of the season...led the league in on-base percentage for the fifth time in his career with a .460 mark...named to the Pacific League "Best Nine" end-of-season All-Star Team for the seventh consecutive year...won his seventh-straight Gold Glove Award. Season was cut short after breaking the ulna bone in his right hand when he was hit by a pitch in late August...led the league in average (.343) for sixth straight season...his .412 on base percentage was tops in the league for the fourth time...named to his sixth All-Star team and won his sixth Gold Glove Award...collected his 1,000th hit on April 20 against Nippon in the Tokyo Dome...hit his 100th home run on July 6 against Seibu. Batted .358 to lead the league for the fifth time in 1998...had more walks (43) than strikeouts (35) for the fourth straight season...won his fifth Gold Glove Award and named to his fifth All-Star Team. Led the league in average (.345) for the fourth straight season...went a Japanese-record 216 straight plate appearances without striking out from April 16-June 25...also earned fourth consecutive All-Star appearance and Gold Glove Award. Was named league MVP for third consecutive year in 1996...his .356 average and .422 on-base percentage led the league for the third straight season. Led the Pacific League with a career-high 49 stolen bases in 1995...named League MVP for the second consecutive year...also led the league in RBI (80) in addition to batting (.342)...set a career-high with 25 home runs. Named Pacific League MVP and won his first league batting title...hit .385 with 13 home runs and 54 RBI...set Japanese baseball record with 210 hits in just 130 games...led the league with a .445 on-base percentage... reached base safely in 69 consecutive games from May 21-Aug. 26. Split time between the two clubs in 1993, hitting .371 with eight home runs in 48 games in the minors...batted .188 with a home run in 64 at-bats with the major league Blue Wave...hit first pro home run June 12 off the Kinetsu Buffalos' Hideo Nomo. Hit .366 in 58 games before he was called up to the majors where he batted .253 in 40 games. Selected by Orix in the fourth round of the Japanese Draft, in November. Inbox: What future role will Ichiro play? March 21, 2019 OF Ichiro Suzuki retired. March 18, 2019 Seattle Mariners selected the contract of OF Ichiro Suzuki from Tacoma Rainiers. January 24, 2019 Seattle Mariners signed free agent RF Ichiro Suzuki to a minor league contract and invited him to spring training. January 24, 2019 OF Ichiro Suzuki assigned to Tacoma Rainiers. May 3, 2018 Seattle Mariners released RF Ichiro Suzuki. March 7, 2018 Seattle Mariners signed free agent RF Ichiro Suzuki. November 3, 2017 RF Ichiro Suzuki elected free agency. January 27, 2015 Miami Marlins signed free agent RF Ichiro Suzuki. October 30, 2014 RF Ichiro Suzuki elected free agency. December 19, 2012 New York Yankees signed free agent RF Ichiro Suzuki. November 3, 2012 RF Ichiro Suzuki elected free agency. July 23, 2012 Seattle Mariners Traded RF Ichiro Suzuki to New York Yankees; New York Yankees Traded RHP D.J. Mitchell to Seattle Mariners and Scranton/Wilkes-Barre Yankees Traded RHP Danny Farquhar to Tacoma Rainiers. April 15, 2009 Ichiro Suzuki roster status changed by Seattle Mariners. April 3, 2009 Seattle Mariners placed RF Ichiro Suzuki on the 15-day disabled list retroactive to March 31, 2009.